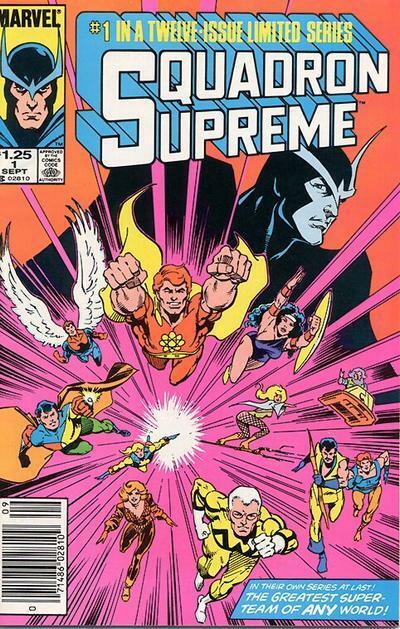 Image July 18, 2014 March 6, 2016 Eric P. I.
Squadron Supreme #1-12 by Mark Gruenwald, Bob Hall, John Beatty, Christie Scheele, Janice Chiang, Sam DeLaRosa, Bob Sharen, Paul Ryan, John E. Workman Jr., John Buscema, Jackson ‘Butch’ Guice, Michael ‘Mike’ Higgins, & Richard ‘Rick’ Parker. Back in 1985, I wasn’t going to buy this limited series. I was on a very tight budget, but somehow my curiosity got the better of me (probably because the Squadron Supreme was Marvel’s poke at the Justice League of America) and I managed to scrape together three quarters a month (except for the first and last issue, which were a whopping $1.25!). Boy, was I ultimately glad that I did. Basically, this book attempts to answer the fan-fave question of “What would happen to the world if superheroes tried to actually do something meaningful?” Not to mention, this came out a year before Watchmen and years before The Authority tread similar ground. I loved, too, how this series would take twists and turns that no other superhero comic that I had read up to that time had taken. Mark Gruenwald did a fantastic job, yes sir (the art, however, is passable). These were characters, not two-dimensional icons in costumes, and sometimes they did good things, and other times, not so much. There’s betrayal and redemption and sacrifice. This story certainly lives up to the term graphic novel. If you’ve not read this fantastic series, I urge you to pick up the trade.